Stylus or touch pens are the ideal promotional products. In this modern day and age everyone has a touchscreen, some even have multiple touchscreens; life without technology is increasingly becoming unimaginable. A stylus pen is the perfect tool for anyone, for their smartphones, graphic tablets and any other touchscreens they use. We at allbranded believe that the printed stylus pen (if used as a giveaway), can say a lot about your company’s high standards and modern, progressive mind set. This product range mixes classic advertising methods (giving out promotional pens & pencils is a tried and tested marketing method, being used for decades by some of the biggest brands around) with innovative, technology promotional products! Blast your business into the 21st century with these state of the art promotional stylus pens! If you are looking for something a little less subtle and a little more attention grabbing, we think you should have a look at our range of promotional highlighters now! Or, if you are going for a more classy look then please see our selection of printed Prodir pens! Stylus pens or touch pens are very useful tools when it comes to dealing with electronic devices, which have an integrated touchpad. There are a variety of these kinds of products in the market, ranging from computers, handheld consoles, and laptops to tablets, smartphones, keyboards and touchpads. With its tiny nib, the personalised stylus pen allows for more precision than your fingers, which can be especially helpful if you are using a small touchscreen – you will also avoid getting fingerprints on your screen. Touch pens are mainly used for operating touchscreens and graphics tablets. A lot of our digital stylus pens have ballpoint pens, stylus tip and laser pointers attached, making them perfectly suited as a promotional item for their multiple uses. 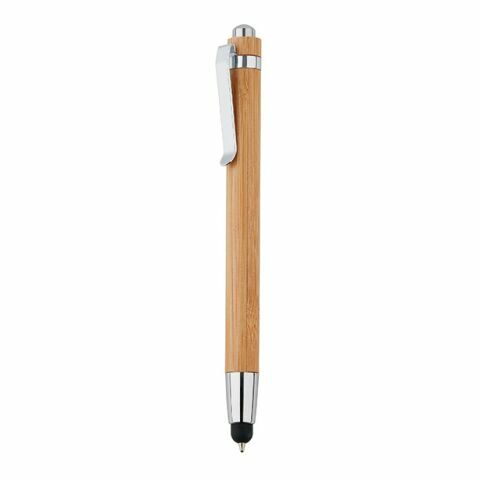 This could be the perfect advertising aid to your company as the promotional stylus pen will prove very useful to the receiver. All stylus pens on our website are ‘Hard on the outside, soft on the inside!’. They consist of a hard plastic exterior with a softer plastic core, which enables easy operation, stability in use, and is gentle enough to avoid damage to the touchscreen. With these modern and useful promotional products, you can not only impress tech geeks, but also reach out to a wide public audience. Every owner of a tablet, e-reader, smartphone or laptop will love these small gifts. Moreover, in this digital age, touch pens are a very popular giveaway item. Their user value is undisputable and will ensure long and regular usage in the office, at home or on the go. Through this, customers, co-workers and business partner will always keep your company logo, which can be printed on these promotional pens, in mind. The personalised stylus will be used often and generate countless brand impressions. Customer acquisition in the digital age – easy and low cost with a personalised stylus pen! We at allbranded have a lot of tips on how you can use stylus pens as effective promotional giveaways. Students are ideal recipients of these touch pens as they are typically in constant use of touch screens. Having a ballpoint and a stylus in one convenient device will prove endlessly useful any time something needs to be noted down. Even if the printed stylus isn’t used by everybody, the pen will still generate interest and curiosity from others due to its unique style. Whether it’s at a big event or a personal sales conversation, a printed stylus such as this can be given to the other person as a small promotional token of appreciation, without seeming too pushy. An electronics business could give these stylus pens to customers with every purchase of an e-reader or tablet, to reward their custom. Another option is to use the touch pens as part of a technology themed gift set for co-workers, business partners and customers. These sets can contain other promotional items such as a keyring (which they can attach their stylus too), a tablet case, power banks, a notepad and headphones. Whatever their purpose, printed stylus pens make creative and unique promo gifts! Your creativity should know no bounds and we at allbranded want to help that creativity flourish with the many options available to you in customising these pens. The colour of your promotional stylus pen should suit the colour of your corporate design, or be in a standard colour like white, black or silver. After that you should focus on the promotional message. At this stage we can offer you various options on how to customise, they can be silkscreen printed or pad printed. There are many different bright and vivid colour options available, as well as the standard black, white and silver. You could also have your product engraved, which will give a more premium look. Decorate your touch pens with the logo, slogan or personalised message of your choice. Our team at allbranded will help you with the planning and which type of printing method will best help you achieve a faster growth in your clientele. To find out more about how these products could help your business or learn about the wide range of promotional products we offer, please get in contact with a member of our sales team!